Signal-regulatory proteins (SIRPs) are cell-surface glycoproteins expressed on myeloid and neural cells that have been shown to recruit SH2 domain-containing protein phosphatase 1 (SHP-1) and SHP-2 and to regulate receptor tyrosine kinase-coupled signaling. One SIRP of unknown function, designated SIRPβ1, contains a short cytoplasmic domain that lacks sequence motifs capable of recruiting SHP-1 and SHP-2. Using a SIRP-specific mAb, we show that SIRPβ1 is expressed in monocytes and dendritic cells and associates with the signal transduction molecule DAP12. SIRPβ1/DAP12 complex formation was required for efficient cell-surface expression of SIRPβ1. Stimulation of this complex induced tyrosine phosphorylation, mitogen-activated protein kinase activation, and cellular activation. Thus, SIRPβ1 is a new DAP12-associated receptor involved in the activation of myeloid cells. Signal-regulatory proteins (SIRPs)3 comprise several transmembrane glycoproteins expressed in neurons and myeloid cells, including macrophages, monocytes, granulocytes, and dendritic cells (DCs) (1, 2, 3, 4). These molecules are also called src homology 2 domain-containing phosphatase substrate-1 (3), brain Ig-like molecules with a tyrosine-based activation motif (5), P84 (6), and macrophage fusion receptor (7). Structurally, SIRPs are characterized by three homologous extracellular Ig superfamily domains and by different transmembrane and cytoplasmic domains (1). One subset of SIRPs, called SIRPα, displays cytoplasmic domains containing immunoreceptor tyrosine-based inhibitory motifs, which recruit protein tyrosine phosphatase SHP-2 (SH2 domain-containing protein phosphatase 2) (1) and SHP-1 (2, 3). Accordingly, SIRPα was shown to inhibit receptor tyrosine kinase-coupled signaling pathways (1). However, SIRPα1 was also shown to potentiate early events in integrin signaling (8) and to positively regulate the mitogen-activated protein kinase (MAPK) signaling cascade in response to insulin when overexpressed in transfected cells (9). Thus, in certain circumstances SIRPα1 may mediate stimulation rather than inhibition. The ligand for SIRPα was recently found to be CD47, an integrin-associated protein with multiple functions in immunological and neuronal processes (10, 11). Consistent with this observation, SIRPα1 was shown to be phosphorylated in response to cell adhesion in macrophages as well as in nonhematopoietic cells (12, 13). Another subset of SIRP receptors, called SIRPβ, contains short cytoplasmic domains that lack cytoplasmic sequence motifs capable of recruiting SHP-2 and SHP-1. In addition, they contain a single basic lysine residue within the hydrophobic transmembrane domain (1). These characteristics are reminiscent of those of a group of NK cell receptors which includes the killer cell Ig-like receptors with short tails (KIR2DS), the CD94-NKG2C/E heterodimers, and Ly49D/H homodimers. These NK cell receptors activate cell-mediated cytotoxicity and cytokine release by associating with a separate 12-kDa protein, called DAP12, which contains a single cytoplasmic immunoreceptor tyrosine-based activating motif (14, 15, 16). To examine the possible association of SIRPβ1 with DAP12, we generated a specific mAb and examined cellular distribution, biochemical composition, and signaling properties of SIRPβ1. BALB/c mice were immunized with human DCs. Myeloid cell-specific mAbs were selected by staining peripheral blood leukocytes and DCs. Anti-SIRPβ1 mAb 148 was further selected by screening against SIRPβ1-COS transfectants. Human monocytic (U937 and monomac-6), NK, and T (Jurkat) cell lines were grown in RPMI 1640 with 10% FCS. Human peripheral blood monocytes, DCs, polyclonal NK, and T cell lines were obtained and cultured as described (17). SIRPβ1 and SIRPα1 cDNAs were cloned into pCDNA3 (Invitrogen, Carlsbad, CA) and transiently expressed in COS cells using Superfect (Quiagen, Hilden, Germany). SIRPβ1 and DAP12 cDNAs were cotransfected in Jurkat cells by electroporation, and SIRPβ1-DAP12 stable transfectants were selected in G418-containing medium. SIRPβ1 expression on transfected cells was assessed by FACS analysis and immunoblot using mAb 148. Coexpression of DAP12 in double transfectants was determined by anti-DAP12 immunoblot on either whole cell lysates or SIRPβ1 immunoprecipitates (see below). Pervanadate-treated (200 μM sodium orthovanadate and 200 μM H2O2 at 37°C for 10 min) monocytes, monomac-6 cells, and SIRPβ1-DAP12-Jurkat cells were lysed in 1% Triton X-100, precleared with protein G beads (Amersham Pharmacia, Uppsala, Sweden) and normal mouse serum, and subjected to immunoprecipitation with mAb 148 as previously described (18). For whole cell lysate analysis, cells were lysed in Laemmli sample buffer. Immunoprecipitates and whole cell lysates were separated by standard SDS-PAGE, transferred to polyvinylidene difluoride membranes (Amersham Pharmacia), and immunoblotted with mAb 148 and/or rabbit anti-DAP12 antiserum (kindly provided by Dr. Kerry S. Campbell, Philadelphia, PA). In some experiments the precipitates were treated overnight with N-glycanase F (Boehringer Mannheim, Mannheim, Germany) according to the manufacture’s protocols. Two million cells/ml were incubated at 37°C with mAb 148 or control IgG (Immunotech, Marseille, France) and F(ab′)2 goat anti-mouse Ab (GAM) (Jackson Laboratories, West Grove, PA) as cross-linker. After stimulation, one cell aliquot was lysed and subjected to antiphosphotyrosine and anti-extracellular signal-regulated kinase (ERK) blotting using PY-20 (Transduction Laboratories, Lexington, KY) and either anti-phospho-ERK or ERK Abs (New England Biolabs, Beverly, MA). Alternatively, after 12 h of stimulation, another cell aliquot was analyzed for expression of CD69 by FACS analysis using a PE-conjugated anti-CD69 mAb (Immunotech). To obtain a SIRPβ1-specific Ab we screened a panel of myeloid cell-specific mAbs against SIRPβ1-COS transfectants. mAb 148 stained SIRPβ1-COS transfectants as well as SIRPα1-COS transfectants compared with the staining of COS cells (Fig. 1⇓A). SIRPβ1/SIRPα1 cross-reactivity was expected because the extracellular regions of SIRPβ1 and SIRPα1 are ∼80% identical (1). In Western blotting, mAb 148 specifically detected a prominent protein of ∼50 kDa in SIRPβ1-COS cells and a ∼90 kDa protein in SIRPα1-COS cells (Fig. 1⇓B). Proteins with similar m.w. were found in monomac-6 cells (Fig. 1⇓C). SIRPβ1 is a 50-kDa glycoprotein expressed in myeloid cells. A, SIRPβ1-COS and SIRPα1-COS cells (open profiles) were stained with mAb 148 and PE-conjugated GAM and analyzed by flow cytometry. Filled profiles represent COS cells. B and C, Whole cell lysates of COS, SIRPβ1-COS, SIRPα1-COS (B), and monomac-6 (C) were analyzed by Western blot using mAb 148. D and E, SIRPβ1/α1 precipitates from SIRPβ1-COS (D) and monomac-6 (E) cells were left untreated (−) or treated (+) with N-glycanase F for 12 h and were analyzed by Western blot using mAb 148. Glycosylated SIRPβ1 overlaps with the IgH of mAb 148. F, Cellular distribution of SIRPβ1 by Western blot determined with mAb 148. Cells, molecular masses (in kDa), and position of SIRPα1 and SIRPβ1 are indicated in the figure. Following immunoprecipitation of SIRPβ1 from SIRPβ1-COS cells with mAb 148 and N-glycanase F treatment of the immunoprecipitate, SIRPβ1 was seen as a ∼40-kDa protein (Fig. 1⇑D). A similar band was observed in monomac-6 cells, together with an additional band of ∼65 kDa, which corresponds to the predicted m.w. of nonglycosylated SIRPα1 (Fig. 1⇑E). Thus, mAb 148 recognizes SIRPβ1 as well as SIRPα1. Using mAb 148 we next studied the cellular distribution of SIRPβ1. SIRPβ1 was detected in lysates from U937, monomac-6, and DCs, but were not found in peripheral NK/CD8 T cells, NK, or Jurkat cells (Fig. 1⇑F). The presence in some cell lysates of more than one band in the 50-kDa region suggests that SIRPβ1 may be present in more that one glycosylated form. SIRPβ1 was always coexpressed with a more abundant ∼90-kDa protein, which corresponds to SIRPα. Taken together, these results indicate that SIRPβ1 is a 50-kDa cell-surface glycoprotein preferentially expressed in myeloid cells. DAP12 and other signaling proteins like TCRζ, FcRγ, and the recently identified DAP10/KAP10 (19, 20) have been shown to be tyrosine phosphorylated upon stimulation or after pervanadate treatment. Therefore, we tested whether SIRPβ1 associated with a phosphorylated protein in myeloid cells. SIRPβ1 precipitates from pervanadate-stimulated monocytes were analyzed by antiphosphotyrosine immunoblotting. SIRPβ1 did associate with a phosphorylated protein with a molecular mass of ∼26 kDa under nonreducing conditions, which decreased to ∼14 kDa under reducing conditions (Fig. 2⇓A). Subsequent analysis of SIRPβ1 immunoprecipitates from unstimulated cells with an anti-DAP12 antiserum revealed that this molecule corresponds to DAP12 (Fig. 2⇓B). Control immunoblotting experiments revealed no association of SIRPβ1 with other myeloid adapter proteins, such as DAP10/KAP10 or FcRγ (data not shown). Thus, in myeloid cells, SIRPβ1 is constitutively associated with a DAP12 homodimer. SIRPβ1 associates with the adaptor protein DAP12. A, Monocytes were treated with pervanadate, and SIRPβ1 was precipitated with mAb 148 or control Ab (cIg). The precipitate was analyzed in Western blot under reducing or nonreducing conditions for tyrosine phosphorylated proteins. B, SIRPβ1 was precipitated from untreated monomac-6 cells and analyzed under reducing conditions for DAP12 association. The molecular masses are given at the side in kDa. DAP12 and Ig light chain (IgL) are indicated in the figure. Because monocytes and DCs coexpress inhibitory and activating SIRP isotypes and mAb 148 recognizes both isotypes, it is difficult to investigate the function of SIRPβ1 independently from that of SIRPα1 in primary cells. Therefore, to explore the possible stimulatory function of SIRPβ1, we cotransfected SIRPβ1 and DAP12 in Jurkat T cells, which do not express SIRPα1, SIRPβ1, or DAP12 (Figs. 1⇑F and 3). Expression of SIRPβ1 in transfected cells was confirmed by immunoblot and surface staining (Fig. 3⇓, A and B). Coexpression and association of DAP12 with SIRPβ1 were monitored by anti-DAP12 immunoblotting on whole cell lysates and SIRPβ1 immunoprecipitates (Fig. 3⇓, C and D). 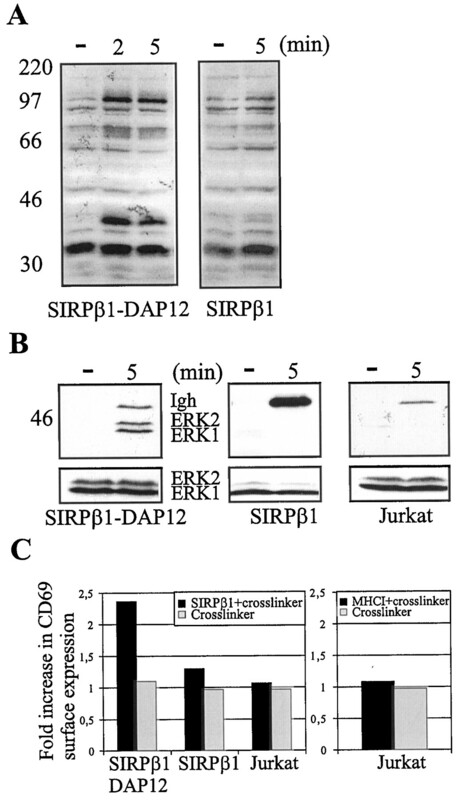 Interestingly, cell surface expression of SIRPβ1 was significantly lower in Jurkat cells transfected with SIRPβ1 alone, indicating that DAP12 is required for efficient cell-surface expression of SIRPβ1 (Fig. 3⇓E). Association of SIRPβ1 with the adaptor protein DAP12 in SIRPβ1-DAP12-Jurkat cells allows efficient cell-surface expression of SIRPβ1. A, Western blot analysis of lysates from SIRPβ1-DAP12-Jurkat, Jurkat, and monomac-6 cells using mAb 148. B, Jurkat (filled profile) and SIRPβ1-DAP12-Jurkat cells (open profile) were tested for cell-surface expression of SIRPβ1 by flow cytometry with mAb 148. C, Western blot analysis of lysates from SIRPβ1-DAP12-Jurkat, monomac-6, and Jurkat cells using a rabbit antiserum against DAP12. 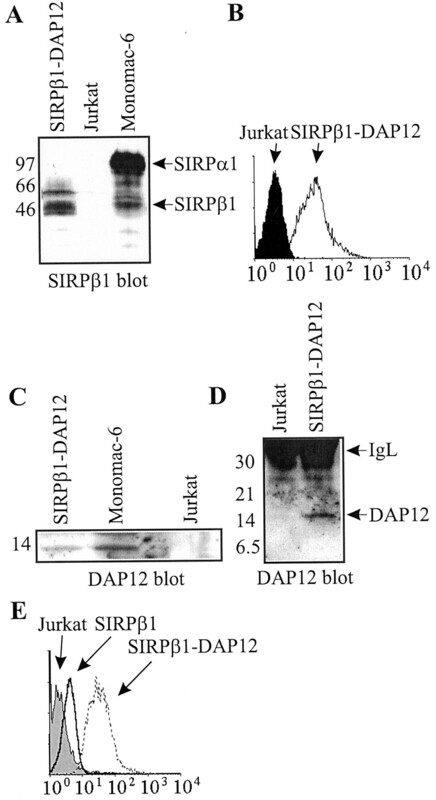 D, SIRPβ1 precipitate from SIRPβ1-DAP12-Jurkat or Jurkat cells was analyzed by Western blotting under reducing conditions for the presence of DAP12. E, Comparison of cell-surface expression of SIRPβ1 in SIRPβ1-DAP12 and SIRPβ1 transfectants. The molecular masses are given at the side in kDa, and DAP12 and Ig light chain (IgL) are indicated in the figure. We first examined whether SIRPβ1 can trigger tyrosine phosphorylation. Aliquots of SIRPβ1-DAP12-transfected cells were either left untreated, or stimulated for 2 or 5 min with mAb 148 and then with a cross-linking Ab and then lysed. Whole cell lysates were subsequently analyzed by antiphosphotyrosine immunoblotting. As shown in Fig. 4⇓A, SIRPβ1 stimulation led to a substantial increase in tyrosine phosphorylation of several proteins with apparent molecular masses of ∼40, ∼70, and ∼100 kDa compared with the untreated cells. To examine whether the observed 40-kDa tyrosine-phosphorylated proteins corresponded to MAPK, immunoblotting analysis was performed using mAbs specific for activated forms of ERK1 and ERK2. As shown in Fig. 4⇓B, Ab cross-linking of SIRPβ1 did induce substantial phosphorylation of the ERK1 and ERK2. Finally, we tested whether stimulation of SIRPβ1 also triggered expression of early cell surface activation markers in SIRPβ1-DAP12-Jurkat cells. As shown in Fig. 4⇓C, after overnight culture in the presence of anti-SIRPβ1 and cross-linking Ab, CD69 expression was up-regulated ∼2.5-fold compared with expression in untransfected cells. The signaling observed following SIRPβ1 cross-linking was strictly dependent upon DAP12 expression because SIRPβ1 single transfectants induced little or no tyrosine phosphorylation, ERK activation, or CD69 up-regulation. Because SIRPβ1 expression is higher on the cell surface of SIRPβ1-DAP12 cells than on SIRPβ1 cells, it could be argued that cross-linking of SIRPβ1 in double-transfected cells may lead to unspecific cross-linking of TCR, which is also known to up-regulate CD69. However, in control experiments, cross-linking of a highly expressed cell-surface molecule, such as MHC class I, did not lead to CD69 up-regulation (Fig. 4⇓C). SIRPβ1 is an activating receptor. A, Phosphotyrosine blot analysis of lysates from SIRPβ1-DAP12-Jurkat cells or SIRPβ1-Jurkat cells stimulated with mAb 148 and GAM as cross-linker for the indicated time periods. B, Cells were stimulated with mAb 148 and GAM for 5 min and the amount of activated ERK1 and ERK2 was examined by Western blot analysis using mAbs specific for activated ERKs (upper panels). Equal amounts of ERKs in each lane were confirmed by reblotting with an anti-ERK Ab (lower panels). C, SIRPβ1-DAP12-Jurkat, SIRPβ1-Jurkat, and Jurkat cells were incubated with mAb 148 and/or GAM. Additionally, Jurkat cells were incubated with anti-MHC class I mAb w6/32 and/or GAM. After 12 h incubation, cells were collected, stained with PE-conjugated anti-CD69 Ab, and analyzed by flow cytometry. The increase in CD69 surface expression was determined compared with the mean fluorescence intensity of untreated cells. The molecular masses, Ig heavy chain (IgH), cells, and mAbs are indicated in the figure. Taken together, our results show that SIRPβ1 is an activating myeloid receptor that forms a complex with a DAP12 homodimer. Association with DAP12 is required for efficient cell-surface expression of SIRPβ1. Upon stimulation, SIRPβ1/DAP12 complex induces tyrosine phosphorylation of a number of proteins as well as cellular activation. The observed signaling properties of SIRPβ1/DAP12 are in agreement with previous results which demonstrate that NK cell receptor/DAP12 complexes induce tyrosine phosphorylation and MAPK activation in NK cells and CD69 up-regulation in KIR2DS2-DAP12-Jurkat cells (14, 15, 16, 18, 21, 22, 23). Interestingly, SIRPβ1 was expressed in myeloid cells, but not in T cells or NK cells. This result, together with the recent discovery of a DAP12-associated C-type lectin called MDL-1 (24), which is also expressed in myeloid cells, indicates that myeloid cells, like NK cells, express a growing number of activating receptors that need to associate with DAP12 to transduce stimulatory signals. What could be the function of these receptors? Myeloid cell activation may lead to secretion of proinflammatory cytokines and chemokines. Particularly in DCs, activation may promote maturation, up-regulation of MHC, and costimulatory molecules, allowing DCs to prime T cells. We have also observed that myeloid cells express both inhibitory and activating SIRP isotypes. It will be important to determine whether these receptors mediate opposing functions or control separate signal transduction pathways in a coordinated manner. We thank Pasquale Vito and Raul Torres for critically reading the manuscript and Kerry S. Campbell for anti-DAP12 antiserum. ↵1 This work was supported by the Basel Institute for Immunology, founded and supported by F. Hoffmann-La Roche Ltd., Basel, Switzerland. J.D. was recipient of a postdoctoral fellowship from the Danish Medical Research Counsel. H.-J.B. was supported by the Deutsche Forschungsgemeinschaft (SFB510, project A1) and by a grant from the Jose Carreras Foundation (Carreras/Bü-1). ↵3 Abbreviations: SIRP, signal regulatory proteins; ERK, extracellular-signal regulated kinase; MAPK, mitogen activated protein kinase; GAM, goat anti-mouse Ab; SHP-1 and -2, SH2 domain-containing protein phosphatase 1 and 2; DC, dendritic cell. Seiffert, M., C. Cant, Z. Chen, I. Rappold, W. Brugger, L. Kanz, E. J. Brown, A. Ullrich, and H. J. Buhring. 1999. Human Sirp is expressed on normal but not on subsets of leukemic myeloid cells and mediates cellular adhesion involving its counter-receptor CD47. Blood. In press.